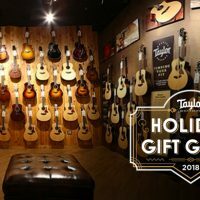 The approaching holiday season means it’s time for the Taylor Guitar Holiday Gift Guide! 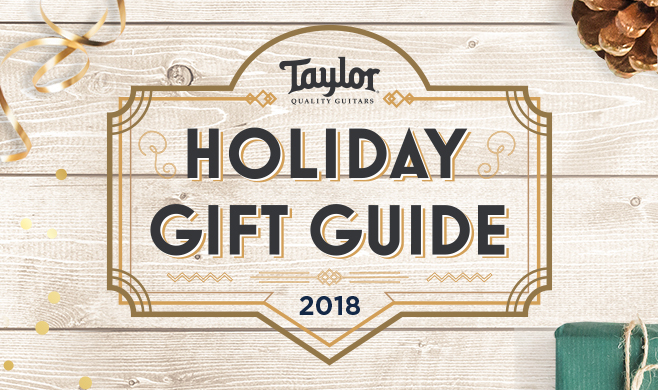 With model recommendations from our expert staff, answers to common shopping questions, and more, our guide is the one-stop shop for all your holiday guitar-buying needs. 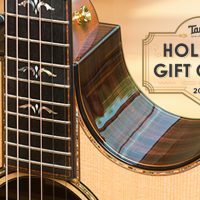 Every year we highlight a handful of guitars that make great gifts for virtually any guitar player, aspiring or experienced. This year, we’ve included guitars from across the line featuring V-Class bracing, along with choices in several body shapes and tonewoods. 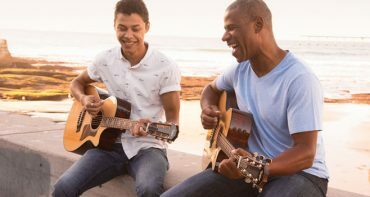 You’ll find selections at every price level to help you narrow down your search and find the right guitar for the lucky musician in your life. There are a couple basic issues that come up with every guitar purchase. Which body shape should I choose? 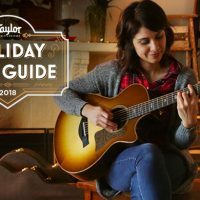 At Taylor, we build acoustic guitars in five body shapes, each with their own unique sound and feel. Around the holidays when folks are looking for gifts, we usually suggest the Grand Auditorium, our most popular and versatile shape, or the Grand Concert, whose compact size and short scale length make it easy to handle and provide a relaxed feel for the fretting hand. Which woods should I look for? 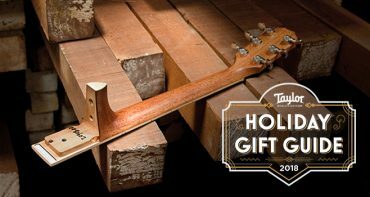 Tonewood selection can be a subjective choice, but if you’re buying a guitar as a gift, it’s easier than you’d think to choose a guitar that’ll make your gift recipient happy. The 700, 800, 900, and 400-R Series feature Indian rosewood, our most popular tonewood and a common choice for professional musicians playing in all styles. You’ll also find it in guitars like the 214ce DLX, which features layered rosewood for durability and rich tone at an accessible price. Maple and mahogany are also quite popular among guitarists. You’ll find maple in the 600 Series, while mahogany appears in the 500 Series. If you’re looking for a guitar on the cutting edge of acoustic design, check out the Builder’s Edition 614ce, a maple guitar featuring a host of player-friendly features and our new V-Class bracing system, which improves the volume, sustain, and tunefulness of the guitar. If you’re looking for something a little more exotic, try Hawaiian koa—it appears in our Koa Series and as a layered wood in the 214ce-K DLX. 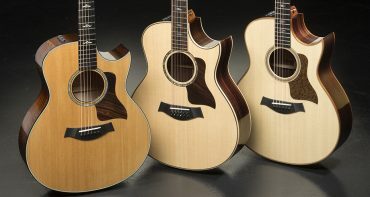 Also featuring V-Class bracing is our Builder’s Edition K14ce, which took the guitar world by storm earlier this year. This is a common question for first-time guitar buyers, but it’s an easy one to answer. The cutaway portion of a guitar is there to allow easier access to the higher frets, making it a more versatile, playable instrument. Most guitars that feature built-in electronics, such as our ES2 pickup, also have cutaways. Some traditionalists prefer guitars without cutaways, but the difference in tone between the two options is negligible to the human ear. 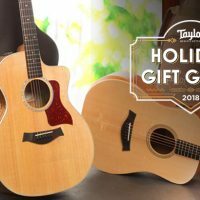 Why buy a Taylor Guitar? 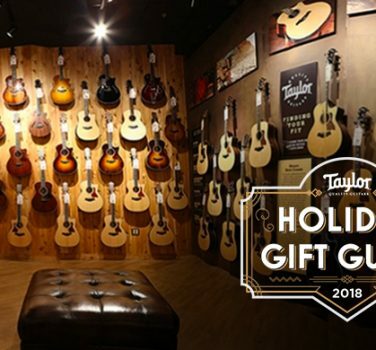 There are many choices for you out on the guitar market, so why should you choose Taylor? Here are a couple of reasons why Taylor guitars stand above the rest. We’re proud of our track record of pushing the limits of the acoustic guitar to create better instruments than have ever been built before. 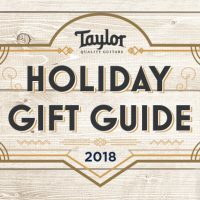 The Taylor Neck is a proprietary design that makes it easy not only to play the guitar regardless of your ability level, but also to adjust and maintain the instrument over time. More recently, we developed V-Class bracing, a new interior design that powers the acoustic guitar to greater volume, longer sustain, and improved intonation—all factors that inspire guitarists every time they sit down to play. We depend on the world’s forests to supply the beautiful natural resources for our guitars. In light of that relationship, we’ve worked to develop more responsible sourcing practices, whether that means koa reforestation in Hawaii or replanting ebony trees in Cameroon. The Ebony Project is our latest environmental program, working in partnership with our co-owned ebony mill in Cameroon and environmental scientists to replant ebony, and supply living wages for the local communities that depend on the ebony trade for their livelihoods. Check in for shopping tips, helpful articles, and more. 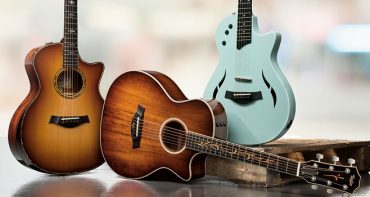 Use our online tool to match up Taylor acoustic guitars head-to-head, with sound clips and video. 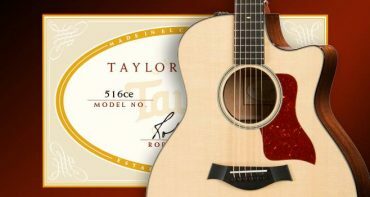 Did you know that Taylor builds custom guitars? 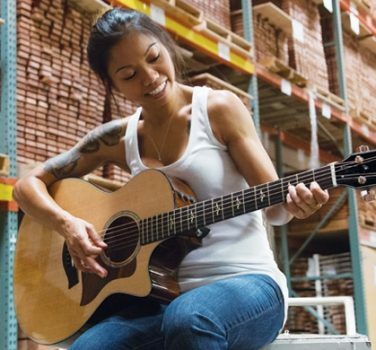 Choose a body shape, tonewoods, and other features to create the Taylor of your dreams. 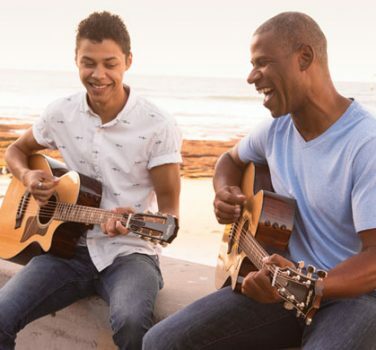 Download our PDF guide to choosing the right acoustic guitar, which factors in style, size, sound, and virtually every other part of the guitar shopping process.